An Asset created in a specific Business Entity is the same as described in Assets under the Common section of the tree. When creating a new Asset for a Business Entity, a must-do is to assign the new Asset to Categories. 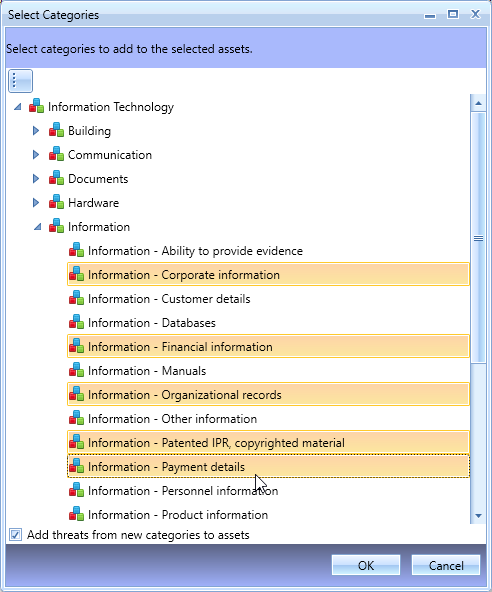 In RM Studio the default Categories are linked to the default Threat library, so when you categorize the new assets, a link is created that provides the Risks in the Risk Assessment. Click the to Add New Categories to the new Asset. A Select Categories popup will present. 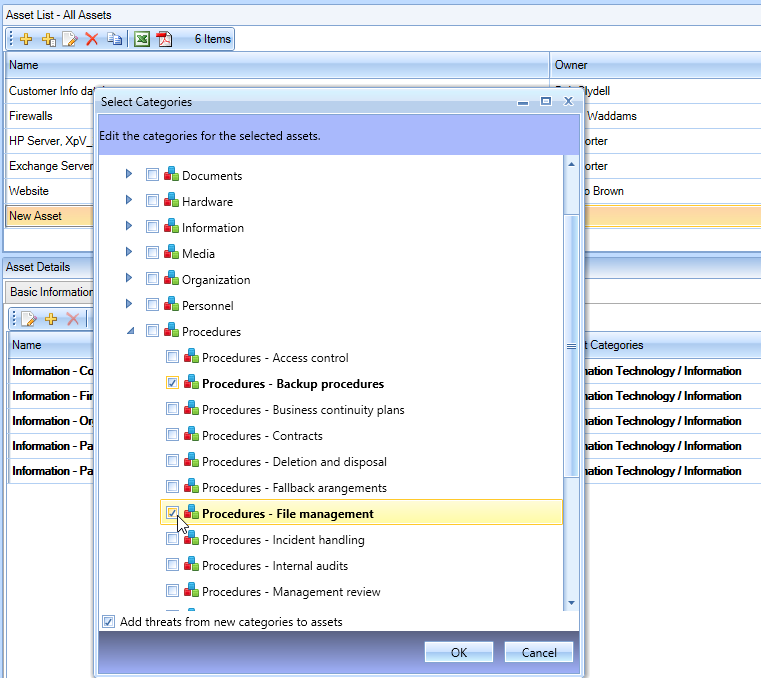 Simply open the list of Categories by clicking the arrowhead and then select the Categories that apply to the Asset. Remember to use the ‘Ctrl’ key and ‘Shift’ key to assist in selecting multiple items at the same time. After selecting all of the applicable Categories for the Asset, click the ‘OK’ button to complete the action. Now the Categories tab in the Asset Details will present the Categories selected. You should also notice the Risks tab now as a total number of Risks in (parentheses). As in our example screenshot below, the Risks tab shows (39). Don’t hesitate to click over to the Risks tab to investigate the Risks now connected to the Asset. Pro tip: Review the Risks associated with the Asset now, and delete any non-applicable risks or add any missing risks prior to creating a Risk Assessment for the Asset. If a Risk Assessment is created for the Asset, then the editing of the risks associated with the asset must be done in the RA. 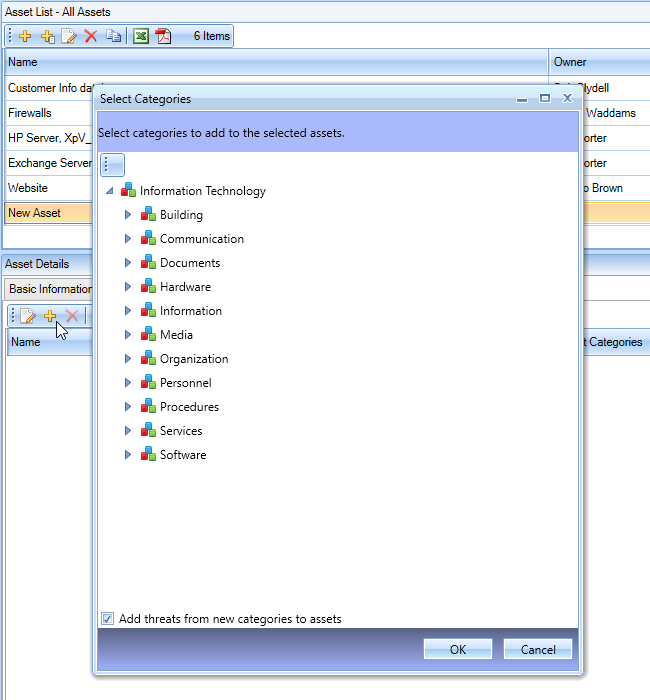 If you want to change the Categories selected for the Asset, then click the in the toolbar to open the Select Categories popup again. Notice that the Select Categories now as check boxes for the selection items. You could use the function instead of the function to begin with. Uncheck any Categories you want to remove from the Asset and the Categories you want to associate with the Asset. Use the to complete the editing of the Categories and to close the popup. Once again you should notice that the Risks tab has most likely adjusted the number of risks associated with the Asset through the new Categories selected. Now our Risks tab in the screenshot shows (52) risks associated with the Asset. It is always a good idea to save your work after adding and editing assets and categories. Use the keyboard shortcut ‘Ctrl+S’ or the icon.